This post is part of a series by Robert Munson called North America’s Train Stations: What Makes Them Sustainable — or Not? 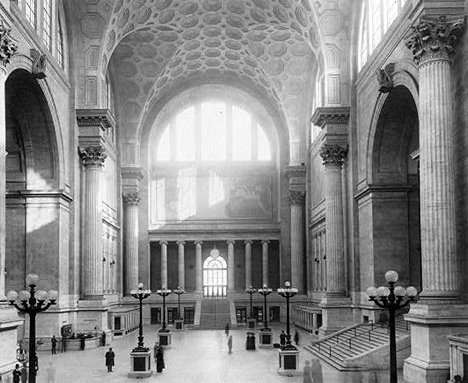 Showing the grandeur of the original Penn Station (destroyed 1963), this main waiting room approximated the volume of St. Peter’s Cathedral in Rome. Photo via Wikimedia Commons. 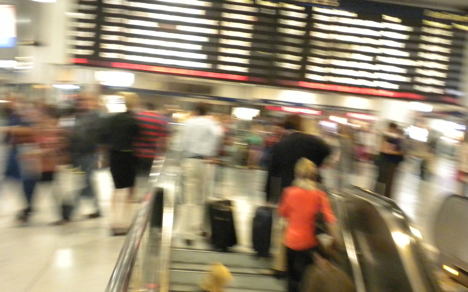 Surpassing the great stations of Europe, Penn Station showed how America would lead the 20th Century. Epoch-making innovation and entrepreneurial risk built tunnels under the Hudson River and directly connected America’s main metropolis to the other commercial centers of a vast, resourceful economy that emerged via the advantages of a great rail network. Penn Station celebrated that achievement by evoking Rome’s style from that previous great Republic. Penn Station’s road back to greatness will be long. This article provides this early step: analyze the Penn Problem frankly and suggest why current agencies cannot develop solutions. We start that step and put Penn in the context of this series by comparing its scorecard to New York’s success story. Score: 60 (see full scorecard, with side by side comparison to GCT) – compare to Grand Central Terminal’s score of of 81. 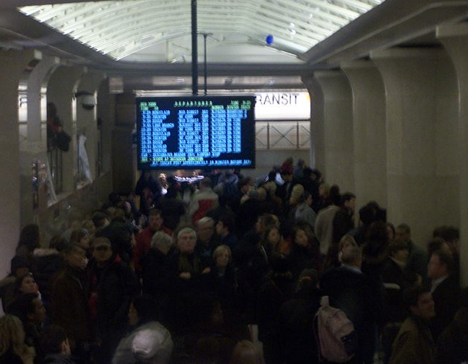 Photo by the author as he scuttles in at 11PM to Amtrak’s concourse… feeling Penn’s pain.Grand Central shows us what happens when good stations are preserved. But if they are lost and replaced by a bad design, then updates won’t work either. Instead of the original, elegant Penn Station, commuters today get a transit rat-hole because government failed to protect a pivotal public asset. Updates to Penn’s commuter concourses and platforms since have been too little, too late, too costly and would never work well anyway. Given Penn’s inflexible design, updates could never accommodate growing commuter demand. Twice as many riders pass through Penn today than was the intended capacity of its 1964 design. Penn’s “curse” is that good money gets wasted because its updates cannot solve the core problem of poor design and poor governance. Why such a mismatch persists in America’s largest transit metropolis is a lesson for many cities. While Penn’s scale is larger, its root cause is similar: failed transportation policy. Transit’s failed governance gets complicated by insular train operators. This historical concoction traps many central stations, particularly Manhattan’s Penn and Chicago’s Union Station. Un-trapping both using today’s tangled agencies will take decades of dedicated civic effort to change how transportation is organized and invested in. Have we got decades? Penn’s problems are a New York legend perpetuated by escalating irritability. Instead of recounting those stories, this article focuses on defending its key suggestion: if a new strategy for ownership is not clarified within a few years, then a new authority must be created to resolve the Penn Problem. 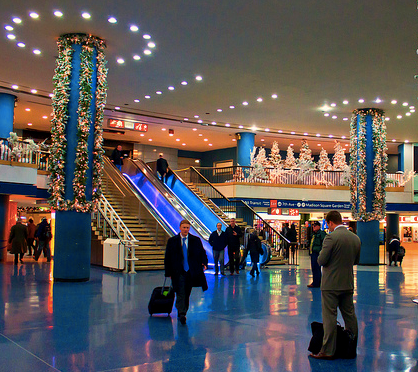 New Jersey Transit concourse at Penn Station, photo via Wikimedia Commons.It is self-evident who owns Penn Station. Amtrak customers have a reception area, a coach-class waiting room with chairs and escalators down to platforms having a decent width. Almost one-third of passengers on the Northeast Corridor trains also qualify for the very comfortable LoungeAcela to wait, work or sleep in. While this Corridor by far is Amtrak’s most important, Amtrak still only has less than 10% of Penn’s non-subway passengers on an average weekday. Photo taken by the author while waiting for his Long Island train. To the left are a row of perhaps two dozen fast-food stands. To the right are minimally responsive ticket agents. Trapped in the middle waiting for a mid-day track announcement, I see why New Yorkers have so much practice complaining.For the other 90%, Penn Station treats commuter rail passengers as if there were a cattle class. NJ Transit and LIRR commuters get packed into stand-up concourses (no chairs) and anxiously await their track to be announced. Not unlike a prod, the board flashes which track and there is crush down into a narrow platform to get a seat next to someone who is not an obvious complainer. To pile on the insults, the people whose fares and taxes will pay for the new station are the ones who suffer this daily saga. In this weird realm of disservice, why should passengers trust New York and New Jersey? Advocates for better transit must ask: what kind of “deal” are governments giving citizens to reward their doing the right thing and minimizing car usage? To answer those questions, let us return to the point at which Penn became destined for transit hell. But, let’s make it easier to stomach by using the best analogy. Like Penn, Chicago’s Union Station primarily served inter-city travel in the first half of the 20th Century. Similar to the original Penn, Union Station’s air rights were sold hastily in the 1960s to appease Penn Central’s creditors. Since then, both stations have had buildings above that abused the intent of air rights by scrunching the growing number of rail commuters for decades. Amtrak owns both suburban commuter stations. But because Amtrak has a national purpose, suburban systems get short shrift. Both stations, theoretically, have state agencies with power to solve these problems. Historically, no agency has proven itself. 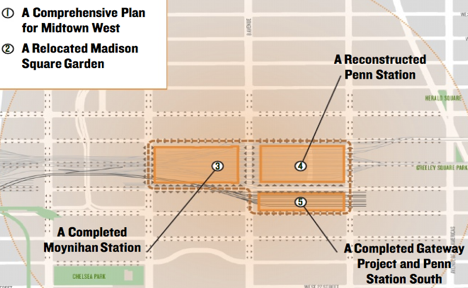 Chicago’s often-proposed central station is the nearby West Loop Transportation Center. (Amtrak would keep its home in Union Station.) This Center could help convert outdated commuter systems to 21st Century standards that include through-routing. As with Penn, Chicago’s Center is no closer to reality… and largely for the same reason: existing governments cannot produce progress. The Alliance for a New Penn Station, a joint project of NYC’s Municipal Arts Society and the Regional Plan Association, recently proposed solutions that can resolve the core problem. Entitled “Penn 2023”, the Alliance analyzes the problem well, then seeks to solve the ownership problem by proposing that Amtrak have a separate building called Penn Station South (below). In critiquing this proposal, I count about a dozen quibbles. Most boil down to an impossible situation: Penn has too many passengers coming into too small a site and no current authority can sort out the resulting chaos of tracks and concourses. But as a positive step, the Alliance is to be commended for implicitly addressing the core problem of ownership by drawing three separate terminals and spreading the congestion. As an outsider, I can be more explicit: Amtrak, New Jersey Transit and LIRR (MTA) should all have their own station. Furthermore, the tracks should be managed by an uber-authority responsible for through-routing. But of course, simplicity’s virtue can often be its vice. Understand the owner’s dilemma. While Amtrak’s weight is great, it can’t solve a mistake it inherited in the 1970s. 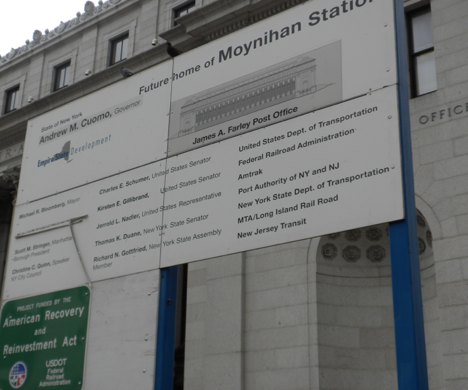 At various times and planning stages, Amtrak has been in-and-out of the proposal to convert the Farley Post Office into Moynihan Station (building 3 in the drawing above). Some $267 million was spent in planning and preliminary construction, about 85% paid by Uncle Sam. With no future funding source, the Moynihan proposal, again, appears stalled. Amtrak’s solution to a nearly impossible situation also is simple: admit that its small customer share does not warrant suffering Penn’s huge headaches and, instead, should develop a station to its specifications nearby. Amtrak should be happy. It has Uncle Sam to give it the easy way out. Quite a separate matter is the New Jersey/New York nexus. It is all mixed up in Penn’s air rights. Madison Square Garden owns them. The Alliance sent a message last year when it convinced the City Council to limit MSG’s permit to ten more years, hence “2023” in the study’s title. Yet, MSG has a major investment and many expect MSG to fight to protect its rights. Lengthy lawsuits employing brigades of the profession’s finest……and the Penn Problem persists. Next, let’s see the scope of the problems so how we, finally, can honor Senator Moynihan properly. The above photo was taken on Labor Day 2013 during my annual trek to the U.S. Open. I compared this to the sign in 2009. Little changed of substance. Of the nine politicians, who fights for commuters? Of the seven agencies listed, who has a credible plan to fund the station? Mayor Bloomberg, the biggest advocate for rezoning the station’s surrounds, also spent five years trying to make real estate deals pay for the station. He has been replaced by a new mayor with an agenda of redistributing wealth — and not to suburban rail commuters. Andrew Cuomo has had over three years as Governor to make this a priority fix. But, he has done little more than his predecessors who had much less power. Three months prior to my photo, the Governor put the Port Authority in charge to restart the Moynihan conversion. Since the sign does not even acknowledge the PA as ‘de facto’ developer, it helps confirm the PA has no believable plan for this complicated real estate deal. What’s more, the PA increasingly is seen as a patronage dump that cannot fulfill its original mission of building infrastructure. This leads some observers to start calling for its breakup. Today, Penn appears to this outsider as a hot potato passed between creaky agencies, each unable to advocate a future vision. Another clue of Penn’s ‘ad hoc’ rule comes from the green ARRA sign. Federal money paid for 85% of Phase 1; yet no agency used this free money to produce leverage for Phase 2 funding. As is true nationwide, metropolitan New York’s dependency on Uncle Sam has no future as a strategy for transit capital. Into this vacuum comes a new concept called “value capture” that, so far, seems to be funding part of the nearby Hudson Yards subway extension. This is at the heart of the MAS Penn proposal and offers a sign of fiscal hope. The scheme’s short explanation is transit raises the value of real estate (more true in Manhattan than elsewhere). In turn, increased building values will generate higher property taxes that the transit agency can borrow against to build now. I am a skeptic of depending on this funding source for several reasons. First, this is the largest station in the western world and requires lots more money than a subway station. Worse for the City, it already was a struggle to get nearby landowners to agree to the value capture for a subway. It is a fair guess they will view a scheme for Penn’s rebuild as a double tax. There also is an ominous Big Picture: value capture needs a decade-long track record of paying bondholders on-time. But, municipal bond markets are nervous about ominous clouds of pensions and insolvency nationwide. Furthermore, squishy funding hurts the private landowners’ equation. Knowing there is not enough money to finish the suburban stations, landowners around Penn won’t invest enough either; further reducing value capture’s contribution. 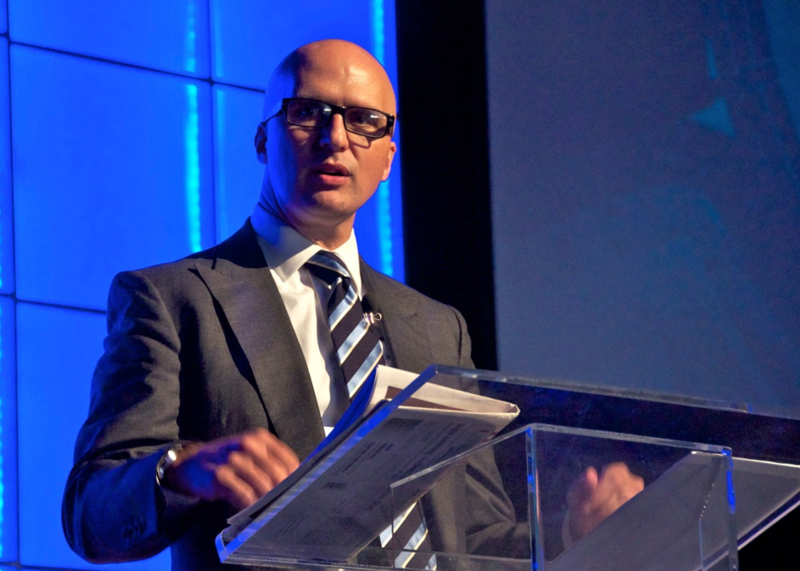 A credible plan must solve these big picture problems around governance and funding. Simultaneous with those changes, the transit agency cannot just put a pretty hat on top of 100 year-old platforms. Three new stations should have a complete update to 21st century transit standards that include through-routing, easy transfers, and tightly integrated mobility systems. This requires big-time money and an authority that can break transit’s old ways. 20th Century authorities cannot implement 21st Century standards. The metropolis’ polyglot of outdated authorities took over failed railroads and, now, have failed even to maintain the old system in good repair. Without money to first fix the systems New Yorkers already got, it is highly unlikely new stations will get built. Transit also must solve its cost-overruns. New York area transit investments have been off-the-charts expensive compared to what global centers in Asia and Europe buy. For example, MTA’s East Side Access project at Grand Central was to cost $2.2 billion in the 1999 federal budget. Today, estimates cost upwards of $11 billion and will be finished as late as 2024. Worse, this exorbitant price tag does not even buy a through-route, suburbia’s track of the future. These budget and timeline busters are multiple-decade affairs. The subway part of this same tunnel was started in the late 1960s that finally connected to its system in 2001. This spooks the public about future major projects. Back at the Port Authority, it has made headlines with astounding cost-overruns at its post-9/11 station… along with newsy scandals such as Bridgegate. Solutions will require deeper and broader political discussion than now seen. Who leads that? Both Governors are looking for their path to the White House, while eyeing the other as a possible rival. Today has no leadership nor lasting momentum for replacing Penn. Finding a responsible owner and funding source for the commuting stations will not get settled finally until the taxpayer agrees. Chances improve when there is a credible agency that serves riders and taxpayers alike with a whole new discipline of managing finances and timelines. That requires a new regional authority, independent of state politics. Giving taxpayers a better deal — while necessary to get capital for transit — is not the topic of this series on defining performance standards for central stations in the sustainable era. But in future years, hopefully 2015, I will explore how regional politics is a prerequisite for sustainable transit. Manhattan’s Penn and Chicago’s Union Station will be case studies. Only unprecedented collaboration of government agencies can make possible the fable’s happy day in which the Beauty (Grand Central) marries (through-routes) the former Beast (Penn transformed into her Prince.) But, a new agency will have to groom the Beast for this story to have a happy ending. Why should the operators all have their own stations? The photos at the start of the article make a compelling case that these concourses should be combined into a single large concourse, LIKE THE ORIGINAL PENN STATION. It wouldnt have the cathedral ceilings of the original with MSG on top, but a 2-story ceiling would be perfectly fine. There is a perfectly fine station (probably a lot nicer than the East Side Access station under GCT) that can serve the necessary demand just waiting to uncovered if we move the Theater at Madison Square Garden (not the arena) and some offices and start knocking out walls. It does not require moving the Garden and especially does not require demolishing a block of midtown to build another station. Funny, cause it was an unprecedented collaboration of government agencies that destroyed the old Penn Station. The author and others have to realize that NY’s car oriented suburbs have little interest in supporting transit. Before new investments are made- cities and towns along the commuter rail lines (Newark, Trenton, Yonkers, New Rochelle Bridgeport, Norwalk, Stamford etc…)must rediscover how rail can benefit their economies. Value capture depends on that. If all of this investment results in just a string of huge park & ride lots and garages- there is no real ROI for these cities. Regional government involvement would be a disaster (most NY suburbs are still car oriented), but some type of working council linking the interests of cities along the rail lines would be a great idea. Right now, State and federal agencies design the stations and lock in huge garages that undermine the economies of these places. Robert, thanks for doing this series. I’ve followed it with interest. 2. Posts in this series would probably benefit from some sort of executive summary or roadmap at the beginning to help the reader understand where you’re headed. Even as somebody who spends a significant fraction of each day slogging through pretty dense reading, I sometimes get a little lost trying to figure out the elements of your analysis and how they relate to one another. You’re doing interesting work, so making easier to digest strikes me as a win for everyone. At any rate, keep it up. Eager to see more in the series. Creating separate stations would be about the dumbest move possible. I particularly like your suggestion that some “type of working council linking the interests of cities along the rail lines.” It may help solve the toughest problem of all. But your idea of a “working council” could greatly simplify the problem. The council needs some blending with private capital buy-in. Since Public-Private Partnerships seem to be mostly a non-starter for the public, I think your idea has great potential. In fact, your idea is so good that it may even transcend the need to have separate (but adjoining) stations! Thanks for what I’ll snag as a compliment. These articles do need Executive Summaries. And I will submit a summary-like for the next station, Los Angeles Union Station. I still think giving any real power to a council would be a mistake right now. Most cities have barely started the conversation about rail and transit oriented development. NYC, obviously has come the furthest and can take some leadership position. The trick is to show these communities how their rail links are the key to unlocking billions of dollars in land value. Jersey City shows the way. Once that value proposition is widely appreciated, the council can at least advocate against the anti-urban station designs and park & ride lots setting the stage for value capture. Any redesign of Penn Station has to be just part of a series of TOD reforms that maximize the value of existing infrastructure. Remember that just filling the trains in both directions will create a huge leap in capacity. A caveat. I’ve never set foot in Penn Central Station. It would seem that one of the biggest problems now is that Amtrack “owns” the station. I think they’d tell you that the station is working just wonderfully. The Amtrak station works just wonderfully. I can’t help but get the feeling that Amtrak is bleeding the station dry for Amtrak’s benefit; even though Amtrak is just a micro-share of the total usage of the station. I can’t help but think that a governance of the station by all stake-holders wouldn’t be better. I think something along the lines of a “Penn Central Corporation” wouldn’t be better. A non-profit with only one asset: Penn Central Station. How this one would be set up is a big question. Seems like the board of directors would include LIRR, NJRR, Amtrak, City of New York, and users of the station. It would seem that having Madison Square Garden right on top of the station would be a tremendous asset. Seems like the Penn Central Station would have little interest in what’s happening above the ground. I’d only be interested in the sub-terrain rights. Re: Farley Building: I wouldn’t worry too much about the building itself. From what I can tell it’s a very nice building, maybe the most valuable in all of Manhattan. Leave it alone. What happens underneath is another matter. Anecdotal evidence would suggest that the LIRR is not the most customer friendliest of organizations. Thanks for the reply, Robert. Keep up the good work. This is definitely a topic that deserves more serious discussion (and action). Agree that further fragmentation of the NYC rail network among 3(!) separate stations is completely backwards and slavishly complies to the current broken American system of segregated transit agency fiefdoms. Integration of platform areas and underground space, as well as the Gateway Tunnel, is the only way to realize the benefits of through-routing, fare integration, and easy transfers. Your idea has potential also at evolving a solution. If stakeholders (the 3 agencies and the public) were to form a Board, they would be ignoring the states who, of course, have significant authority and could stop the whole matter. However if the public and the Board were to put pressure on NY and NJ so they turned the other way (which is not asking a lot since the two states essentially have ignored this Penn Problem), then the Board at least could explore options and run public campaigns and it might stimulate some real solutions. Great transit systems are not just about the great central stations but about how systems interact and how the more minor feeder stations are used. The Newark post starts to get at some of this. A post or two about the more minor stations would be useful. How can improved rail links & design revive places like Newark, Bridgeport & Stamford? How might that impact the overall sustainability of surrounding areas? It’s pretty amazing how the whole thing works out when you think of how many trains move through the area. On our disagreement about separate stations… Let’s parse the problem and see where we agree. In the abstract, you are correct: the stations and concourses should not be separate as all transit systems should integrate. But, that is the abstract. Out of respect for the folks in the trenches (RPA and MAS being the primary ones who stepped forth with a solid proposal), I highlight their proposal’s tacit acknowledgement that Amtrak should have a separate station; albeit connected underground. This is reasonable in reality: Amtrak has different needs, more money and more authority (legal and tacit). In the case of Penn, I read between-the-lines that Amtrak is fed-up dealing with two rival states. In short, Amtrak is too powerful to be a station partner and an unhealthy NY/NJ nexus prevents Amtrak from its different mission of connecting cities. Everyone wins when Amtrak sells off Penn Station as it moves across the street. My guess, however, is that the metropolis does not get a new station until the two states create an uber-authority better than they got now. Until that happy day, spadework can proceed: let’s give consideration to John Morris’ idea (early in the Comments) of creating a working council. I guess the way to start shaping that council is for the RPA to take their leadership to the next level. I want to thank Thomas and wkg in bham for their links to diagrams. 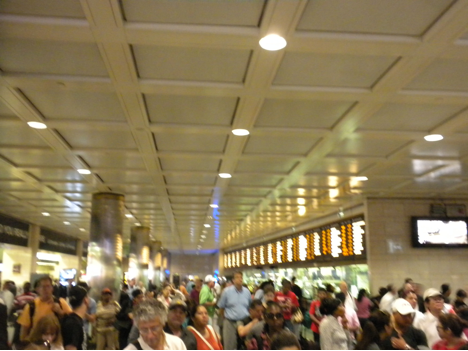 Both reinforce my conclusion that there simply too many trains and people converge on Penn Station. Unfortunately, I read only half-way thru the list of fast-food joints before I associated the smell of grease that triggered a nausea similar to when I waited for the train to Long Island. Penn Station is a totally-integrated heart-stopper. This convenience is the basic benefit of the station. Yes- it’s a total disaster since delays on The LIRR, NJ Transit & Amtrak are so common but this is a management problem. Also, I didn’t spend time looking closely, but the proposal to divide service looks like it will waste all or most of 3 huge blocks in the center of Manhattan. The proposed post office site is already huge. IMHO, until the larger management issues are dealt with, the best solution is to do nothing. We see the problems bad designs can cause. Well Robert, too many people and their awful habits pretty much define a place like Manhatten. Would it better station with fewer trains? On a serious note… Let me conclude my work this year on Penn with two key points of the The Big Picture. First, the discussion was particularly helpful in seeing a way out of The Penn Problem. (While NY is unique, its solution is relevant to other cities.) I boil down John’s and others’ comments to a multi-centered real estate strategy that rebuilds urban centers (such as a half-dozen Newarks) to compete with Midtown. This shifts from today’s reliance on fragmented governments (who lack coordination to solve the Problem) and, instead, uses the private sector to decentralize the region into mixed-use multi-centers. I’d think the simple way to congeal this strategy is to take RPA’s advocacy work to a larger, more dynamic level. I respectfully defer to the experts on how to do that. Second, I work with assumptions that, perhaps, could be more explicit. One is central stations are microcosms for how transportation systems need multiple measurements (economic and fiscal) to evolve towards sustainability. (This is less relevant to NY Metro because its % of transit riders is world class). But this is a series (project perhaps) currently relevant to over 50 American cities. The purpose of the scorecard (the link at the top of the article) is to explore those multiple measurements so that other cities can at least be aware of whether their investment in a central station will take their overall transportation in a sustainable direction. So if this scorecard is of interest to you or might be relevant to your city’s central station, shoot me an email at robertmunson@earthlink.net. 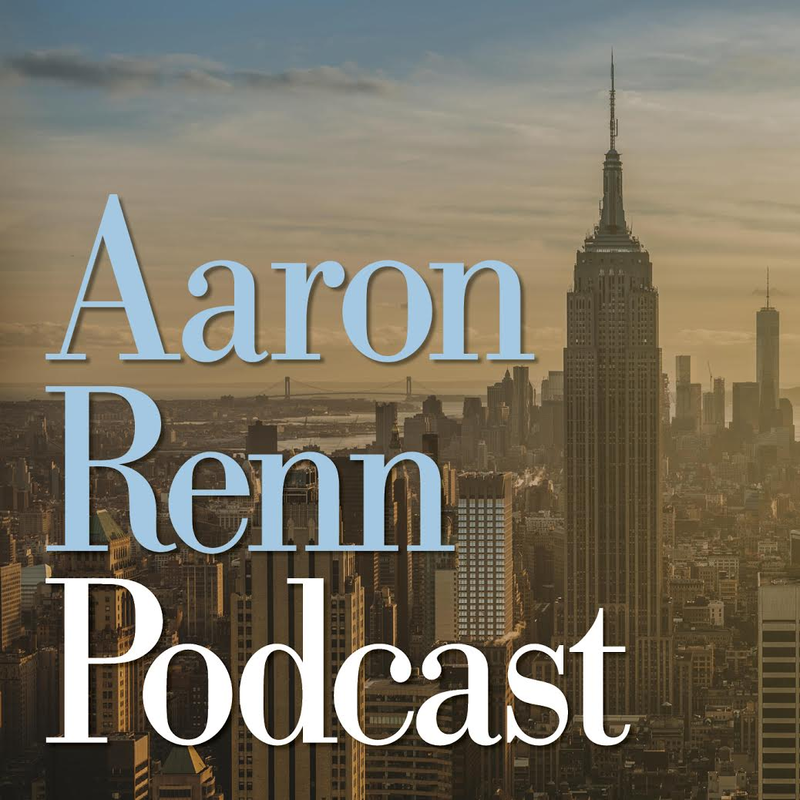 As long as Aaron will have me, I’ll write articles for “The Urbanophile.” But my goal is to help create rough tools to reduce the cost of every city trying to reinvent its wheels. Why not just blow up Manhattan & make it a farm? Clearly, the density and a lot of trains are what the whole thing is about in the first place. I do tend to agree that Penn Station probably needs to be a single use facility (Shopping & Restaurants are part of that) or one in which transportation dominates. The current site is oriented around Madison Square Garden, with everything else crammed under and around it. @Robert Munson roughly describes my long term thinking. I don’t really see these multi use cities along the train lines competing with Manhattan as much as complementing it. More people live in Manhattan and commute out by rail & more people live in places like Norwalk, Stamford, Yonkers & Bridgeport & commute in. Single use places like Metropark might become multi use cities. Balancing development in both directions, smooths out peak surge problems and radically improves the economics of transit by keeping trains full.